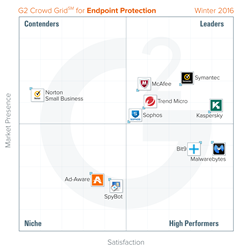 G2 Crowd, the world’s leading business software review platform, today released the Winter 2016 Endpoint Protection Software Grid report to help businesses make the best endpoint protection technology decision. Kaspersky Endpoint Security, Symantec Endpoint Protection, McAfee Endpoint Protection, Trend Micro Endpoint Security, and Sophos Endpoint Security were named Leaders in the report, receiving strong customer satisfaction scores with a large market presence. Malwarebytes and Bit9 Security Platform were named High Performers in the report, earning strong customer satisfaction marks with smaller market presence scores. Malwarebytes earned the highest overall satisfaction score while Symantec Endpoint Protection earned the highest overall market presence score. The Importance of Non-Invasive Protection — Users frequently commented on the intrusiveness of endpoint protection programs. They greatly preferred the platforms to remain quiet and out of sight. Headed in the Right Direction? — On average, only 70% of users felt that their endpoint protection solution was headed in the right direction. Protection is Not Perfect — While endpoint protection platforms do their best to adapt to new forms of malware and viruses, rarely did a reviewer comment that they had a perfect detection rate. Of the roughly 50 products listed in G2 Crowd’s Endpoint Protection category, the ranked products each received ten or more reviews to qualify for inclusion on the Grid. G2 Crowd, the world’s leading business software review platform, leverages more than 50,000 user reviews to drive better purchasing decisions. Technology buyers, investors, and analysts use the site to compare and select the best software based on peer reviews and synthesized social data. Monthly more than a half-million people visit G2 Crowd’s site. Co-founded by the founder and former executives from SaaS leader BigMachines and backed by roughly $12 million in capital, G2 Crowd aims to bring authenticity and transparency to business technology research. For more information, go to G2Crowd.com.